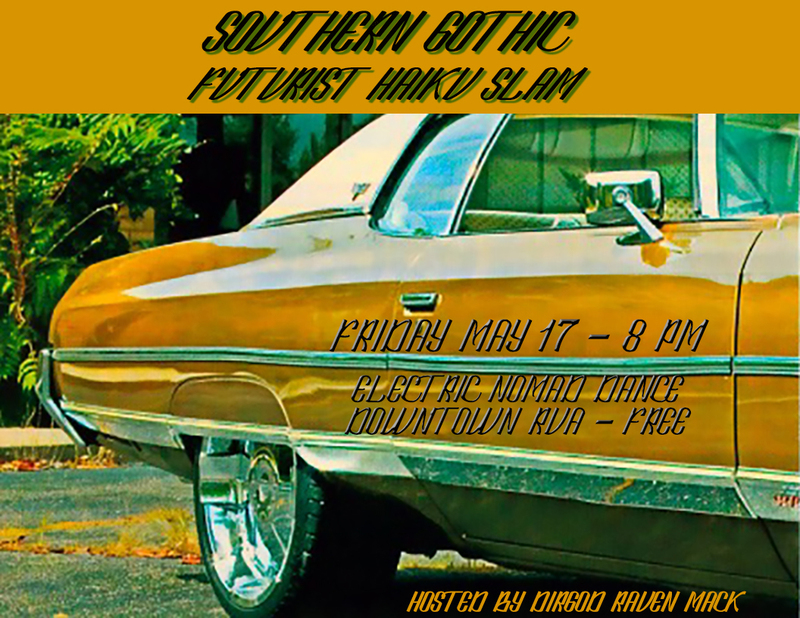 The 411 on upcoming Sovthern Gothic Fvtvrist Haiku Slams. Sponsored by The Pie Chest! Bring 15-20 haiku to compete in the open mic haiku slam, $40 to winner, $10 to runner-up. Bring a handful extra, or only a couple, to compete in the haiku battle royal, $20 to winner. Haiku death match is Dirtgod Raven Mack vs. Veronica Haunani Fitzhugh, in what may be one of her last public events in Charlottesville before moving on from this place. Come out and get wild with your cousins. First one at Electric Nomad was so much fun. Haiku death match is Dirtgod Raven Mack vs. Detritus King Mo Karnage. Working on sponsors still. Thanks to Twila Jane and Silver for hosting us again! Our regular gig at Tea Bazaar for June. Always a spectacle. Don't forget to check out the monthly open mic at the Tea Bazaar as well, on the first Monday of each month, hosted by your boy Raven Mack. I do also have an official (lol) website now, with a page on haiku slams there as well - check it out - and book me to come do one of these things in your neck of the woods.